If you aren’t one of the lucky ones who has a large front porch with banisters that make tying Christmas lights up a breeze, I’m sorry! But more importantly, we can help. Depending on how simple or beautifully complex you want to make this, we may be able to offer some helpful advice for hanging Christmas lights. Don’t hurt yourself in the name of Christmas this year! Consider adding lights along eaves, pillars, posts, windows, and doors to highlight architectural features. Since you probably see the backyard more than the front, consider adding lights there as well. Decide where your lights will go and make sure you have enough lighting for that area. Using a long measuring tape (preferably 25 feet or longer), measure the length of your house along the ground and measure its height. Next measure the lengths of the light strings you are using. Figure the number of light strings it will take for all these measurements. You don’t have to wait until you’re ready to hang the lights to get a lot of the prep work done such as running the outdoor extension cords, installing hooks, clips, hangers and so forth. The obvious danger is falling off the roof. One safe idea is to use a vertical lifeline. The basic premise is to cast a line over the house then connect the lifeline and pull it over. Secure the cast end to anything that will hold a heavy load. Once it’s over the house, you have a decent vertical fall safety set-up. Don’t forget to snap your carabiner or vest to it. Outdoor lights need to be plugged into circuits that are protected by ground-fault-interrupters (GFCIs). Power stakes that are portable devices that bring power where you need it will keep you from running cords everywhere. Never use lights intended for interior use outdoors. Don’t rig things together that are not supposed to go together. Always put transformers and light changing controllers indoors to keep them protected from the elements (unless they are designed for outdoor use). Never overload power points. This is one of the most common causes of fires. Choose plastic hooks to mount your lights instead of nails, staples or screws. Never connect different types of lights on the same circuit or outlet. Read manufacturer recommendations to determine the number of lights you can safely string together. Hang a bucket with an S hook to connect to the ladder to hold supplies. Before you put your foot on that first rung of your ladder, stop and check the lights for signs of wear, damage, frayed wiring and burned out bulbs. We’re not building a house but we don’t want to burn one down either so: Mini-lights are the most popular today because they are inexpensive to buy and to operate thanks to their low voltage bulbs. The larger bulbs get very hot and use considerably more energy than an equal number of mini-lights. On the other hand, the larger bulbs are heavier-duty and are more reliable than mini-lights. To extract a broken mini-light bulb, unplug the string, wear gloves and use long-nose pliers and pull it straight out. Larger bulbs typically unscrew. Retest the string to make sure all the lights work. If they don’t, then check it for a blown fuse. If the fuse blows more than twice, replace the entire string. Use a switch-controlled outlet or plug the lights into an outdoor-rated automatic timer. Check to be sure that the receptacle’s circuit and the automatic timer are rated to handle the combined amperes of all the light strings. Short strings of 50 lights are generally better than longer 100+ light strings because it is easier to replace a short defective string than a longer one. Check all of your string sets to ensure that they are UL-approved for outdoor use. Lastly, you’ll need a heavy-duty extension cord because those lights never come with enough slack to reach the outlet! The best time for hanging Christmas and outdoor holiday lights is before your weather turns wet and cold. It’s much easier and a lot more comfortable to work outdoors on milder days. Set up an extension ladder and place it firmly on flat ground and extend it well above the eaves. Lean it against the eaves at an angle that will be comfortable and safe to climb. If the ladder has to lean directly against the gutter, then place a short piece of 2 by 4 inside of the gutter for reinforcement. Using plastic clips made for hanging Christmas lights, hang the lights along the eaves. Your goal is to hang lights as safely and easily as you can without creating more work for yourself by marring your home’s trim or walls. Attach the lights to the trim. Space the lights about 12 inches apart or whatever you prefer. Do not use nails or staples to hang the lights because they can pierce or nick the protective insulation and create an electrical hazard. 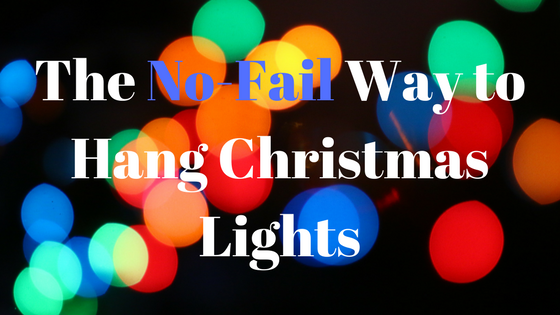 For other options you can check your local retailer or your favorite online store for Christmas lights hanging poles and other cool inventions for hanging your Christmas lights up easy and safely.